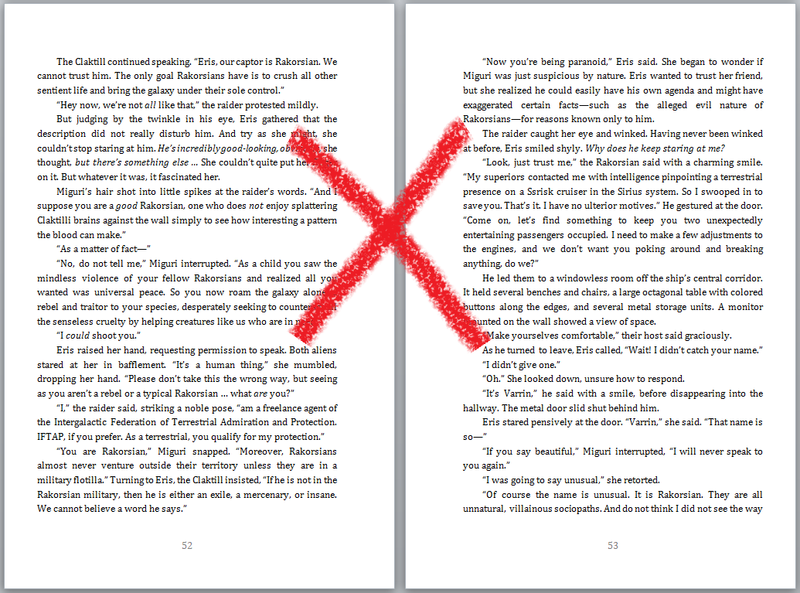 In my continuing attempts to promote and improve the self-publishing scene, today I present a handful of helpful tips you can use to make your self-published print book look more professional. These tips have been compiled via examining multiple traditionally published books and comparing them to the collection of self-published books I’ve acquired over the years. Read and enjoy! Note: I’ve used my own book for all the examples below, as copyright law is confusing and I don’t want anyone to sue me. 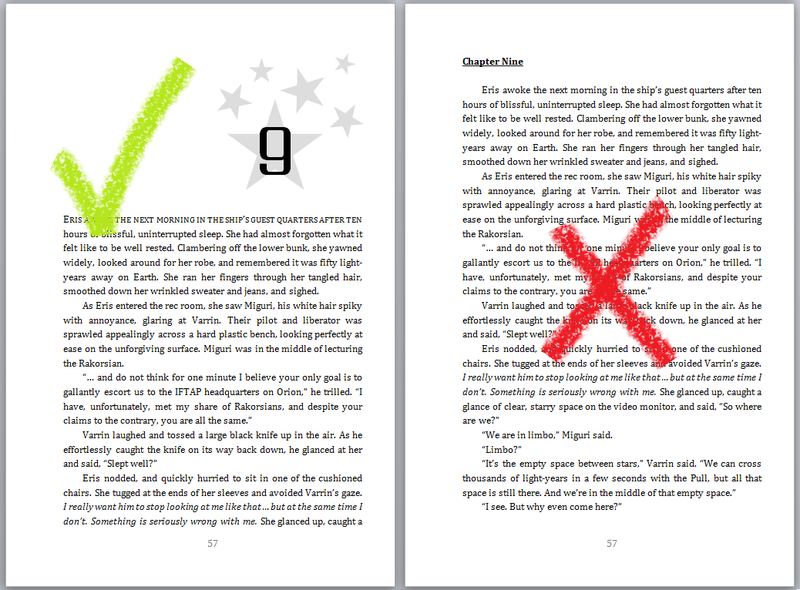 Step 1: Page numbers should begin on the first page of your story. This means Chapter 1. If you have a prologue, use Roman numerals (i, ii, iii, iv, v, vi, etc.). Do not start page numbers on the very first page of the book (i.e. the title page). Step 2: Page numbers should end once the story is over. You can obviously keep them going into the Acknowledgements, but no blank pages at the end with page numbers. Bad! 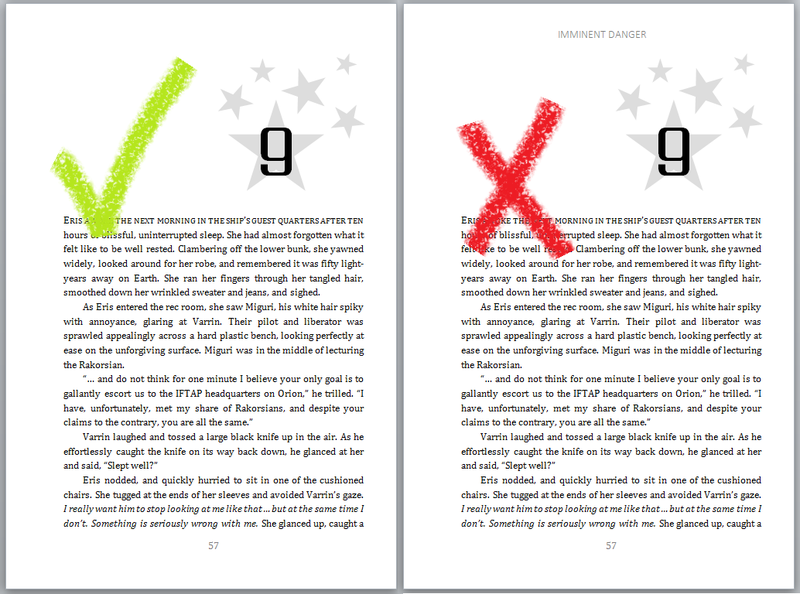 (Updated) Step 3: Page numbers can go at the bottom of the page or the top of the page. A random survey of my bookshelf indicates it’s about 50/50. I personally prefer numbers at the bottom of the page, centered, but this one seems to be dealer’s choice! 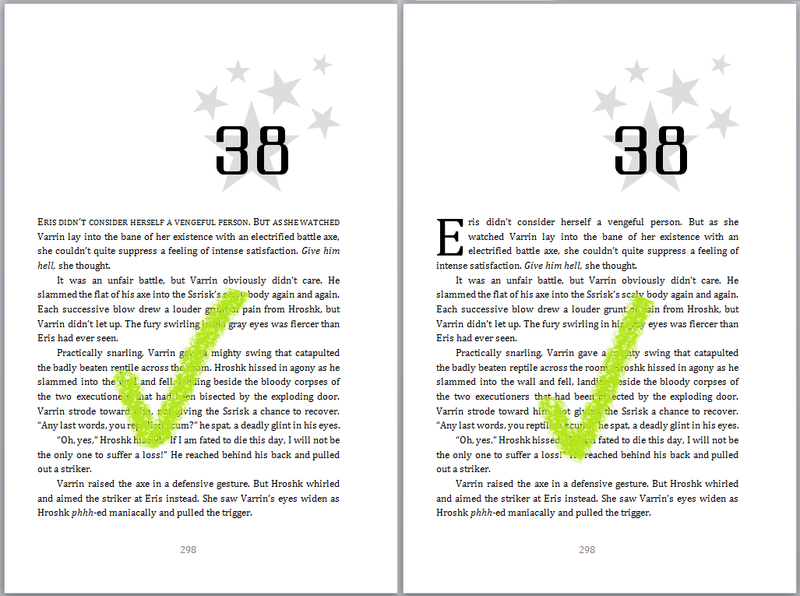 Step 4: Put enough space between the text and the page numbers. Otherwise the page will look squished, and pages don’t enjoy being squished. That’s how bloody revolutions start. 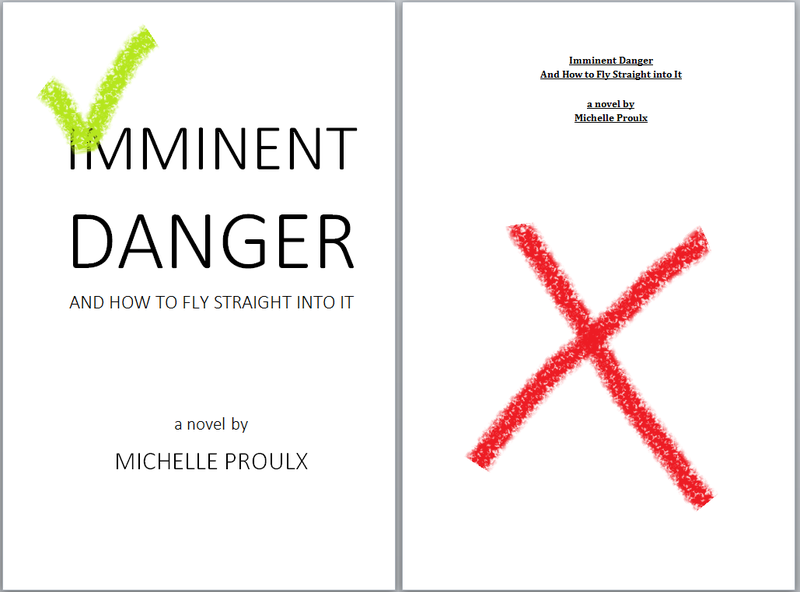 This is technically up to you, but cream paper really does look better than white for fiction books. White paper is for textbooks and picture books. Go with cream. I’d suggest making your book between 5×8 inches and 6×9 inches for a fiction book. Anything bigger is kind of awkward to hold. Not to mention it doesn’t fit very nicely on your bookshelf with your other novels. Step 1: Your title page should be eye-catching. None of this “same font and size as the paragraph text” nonsense. Step 2: Put the front matter text (i.e., copyright info, “please do not illegally distribute this work” info, publishing info, etc.) on the back of the title page (i.e., the left-hand side). The right-hand side page after the title is usually reserved for the dedication. Step 1: Use headers. They look classy. You want the author name on one side, and the book title on the other side. And for heaven’s sake, make sure the header is centered. Step 2: But make sure you don’t have a header on the first page of a chapter! It makes it look cluttered. Clutter is evil. 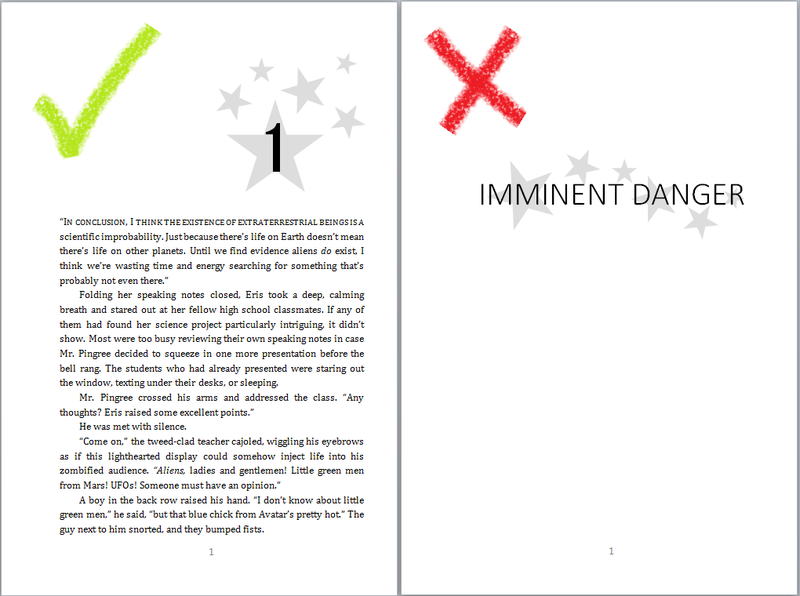 Step 1: Speaking of the first page of a chapter, make sure your chapter titles are eye-catching. 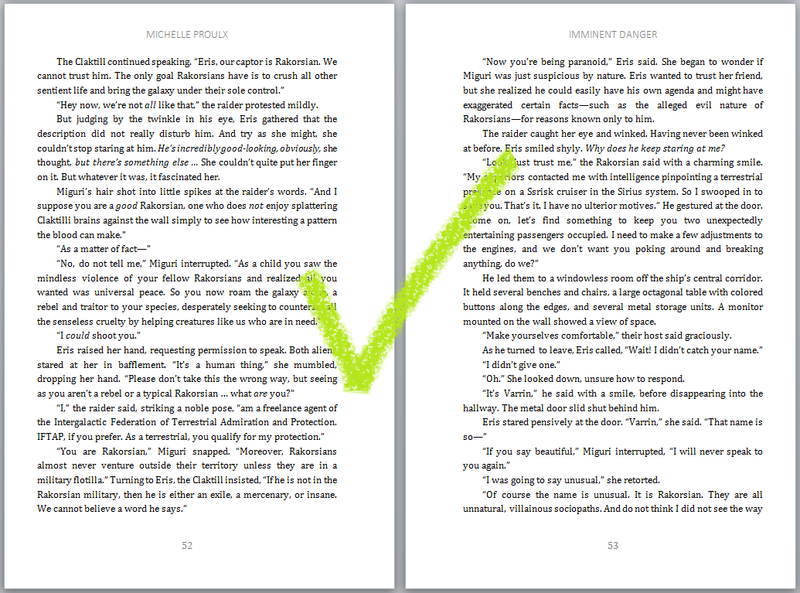 Step 2: Use small caps or drop caps on the first paragraph in a new chapter. Step 1: Don’t use Times New Roman or Arial. These are used in everything, and will make your book look generic. Update: The important thing to note about Times New Roman and Arial is that they’re very easy to read. So make sure the font you pick is readable. Some good options include: Georgia, Cambria, Garamond, etc. Step 2: Don’t underline. Use italics if you need to emphasize something. Update: Some people don’t like italics used at all in writing as emphasis, and that’s personal choice. The point here is not to underline or bold your text, as it in general looks amateurish. Unless you’re writing something a bit off-beat, like a humor book or a book where your text is spaced out to look like a shark head. In which case, do whatever crazy formatting you want! Step 3: Don’t put space between paragraphs. Instead, tweak the space between the lines of text to make sure it doesn’t look too squished. But for the love of chickens do not use double-line spacing. This makes it look like an essay, and that’s the absolute last association you want to make. Step 4 (update): Always justify your paragraphs (as in, each line of text should reach from the left to the right side of the page). Left justification is fine for your Word doc, but it looks a bit sloppy to have uneven text edges once you get to your final published version. 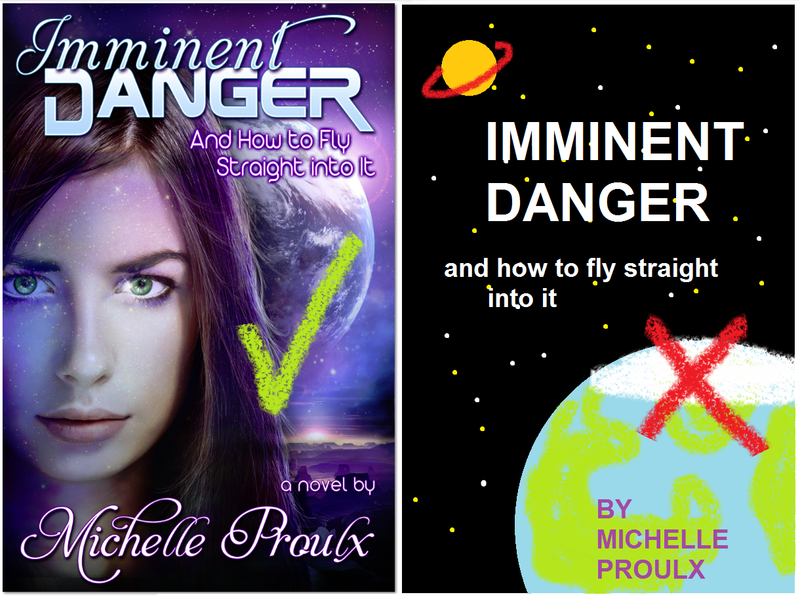 Get a professional cover design. Seriously. Your readers, your sales stats, and your book itself will thank you. Note: My Paint skills are truly out of this world. 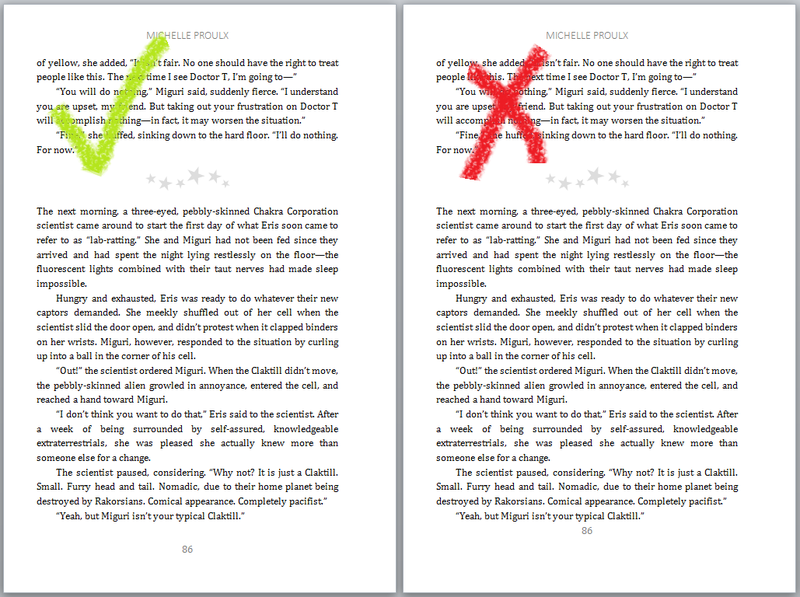 When in doubt about a particular bit of formatting, pick up a traditionally published book and flip through it. Heck, pick up a couple of books. If they all tend to do the same sort of thing, formatting-wise, then you should probably do the same. This concludes my tips! Seriously, though, flip through some traditionally published books. You can get some really great formatting ideas from them. And obviously these aren’t hard and fast rules. But if you follow them, you will definitely have a more professional-looking novel than when you started. As always, if you’ve got questions, hit me with them in the comments section below.